Since our founding we have been family owned and operated. 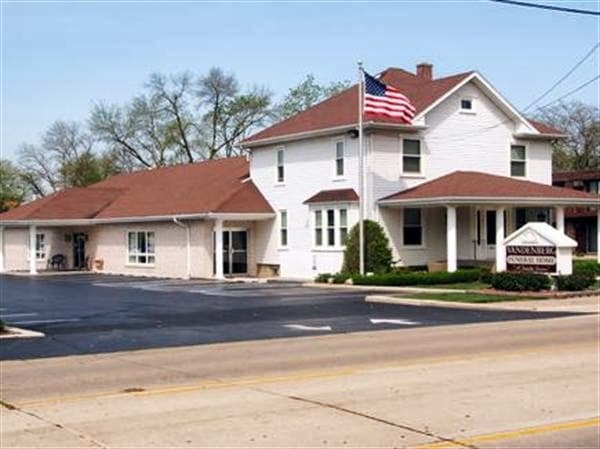 Our family has been involved in the funeral business for nearly 70 years with our history stemming back to the original family owned funeral home in Blue Island, Illinois which was established in 1937 (Pictured on left). 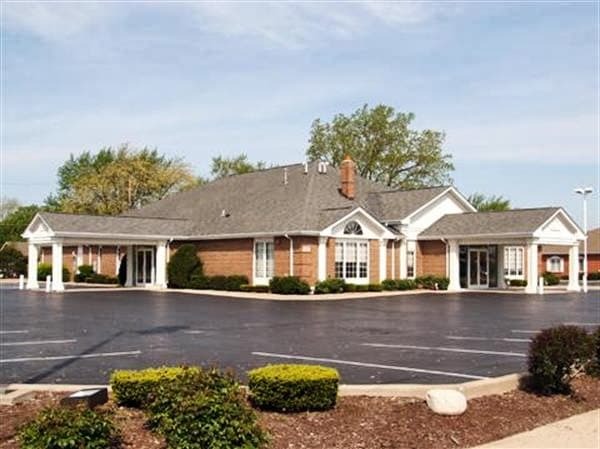 Our original Tinley Park location was established in 1965 near Oak Park Avenue in "Downtown" Tinley Park. In 1997 we opened a new, modern facility in Tinley Park on Harlem Avenue, moving from our original Tinley facility. 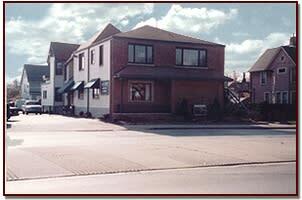 In 1985 we purchased an old farm house on Wolf Road, we restored and expanded the new Mokena location, opening in 1987. Another aspect of our family business was the ambulance service; this service worked together with the funeral home, as the funeral homes has long vehicles that could be used to transport patients to hospitals (ie. Hearse coach). The ambulance service was created to fill an unmet need for emergency medical transportation. In the early days of EMS, Vandenberg Ambulance was the only option for communities located in the south suburbs of Chicago. The company responded to motor vehicle accidents in communities from Blue Island to Joliet, and over time, began serving hospitals and nursing homes. The services provided in the very beginning were only those of a first responder, and that was simply the transport of an injured patient to the closest hospital. The Vandenberg Family, has always insisted on staying involved throughout the communities they live and work in. The funeral home operates in best practices in funeral service, and strives for excellence when conducting funeral services for families we serve. We make a point of working together with area churches and charitable organizations to meet the demand of the community with an open mind and giving heart. Carl R. Vandenberg is the founder of Vandenberg Funeral Homes in 1965, as well as a co-founder of Hickey-Vandenberg Ambulance (currently known as Vandenberg Ambulance). Carl graduated from St. Benedicts Catholic School in 1943, Blue Island High School in 1947; and Worsham College in 1950. Carl, then was drafted into the Korean War; serving in the American Graves Registration Unit in Korea, from 1951-1953. After serving in the war, Carl worked in the funeral industry before he opened his own Funeral Home. Carl is a proud 50 year member of the Illinois Funeral Directors Association. Carl is a lifelong parishoner of St. George Catholic Church, a member of the Kinghts of Columbus (reaching as high as Grand Knight). He is also a 50 year member of the VFW and American Legion of Tinley Park, IL. He was a dedicated member of the Tinley Park Lions Club. Carl has raised his family in Tinley Park, IL and was proud to stay very active in the community until he was called home. Gary is the son of Carl Vandenberg, continuing the legacy of funeral directing. Gary graduated from St. Geroge Catholic School in 1974, Tinley Park High School in 1978, and Worsham College of Mortuary Science in 1987. Gary is a life long parishoner of St. George Catholic Church and a member of the Knights of Columbus. Gary is a founding member of the Tinley Park Sertoma, former member of the Tinley Park Jaycee's; past President and Athletic Director of the Tinley Park Athletics Association "also known as Tinley Park Bulldogs", Past President of the St. Jude Knights hockey organization, and a former board member of the Amatuer Hockey Association of Illinois Tier 2. He is also a member of the Illinois Funeral Director Association. Jacob is the son of Gary Vandenberg, and is a fourth generation Funeral Director. Jacob is a 1998 graduate of St. George Catholic School, 2002 graduate of Providence Catholic High School, and a 2006 graduate of Worsham College of Mortuary Science where he received his Associates in Applied Science. Jacob lives in Tinley Park, with his wife Carrie and sons Oliver and Logan. Jacob is very involved in the community; having been elected an Orland Township Trustee (2009-2015), Tinley Park Trustee (2015-2017), and most recently Mayor of the Village of Tinley Park (2017-). Jacob takes great pride in the dignity and honor he provides to the families that he serves at the Funeral Home; he takes that same approach to the residents in the community he serves. Among the work at the Funeral Home, Jacob, enjoys volunteering time to help Boy Scout Troop 378. He is a member of the Tinley Park Chamber of Commerce, the Illinois Funeral Director Association, National Funeral Directors Association and the Knights of Columbus Fr. CC. Boyle 4698. Joshua Vandenberg is the son of Gary Vandenberg and brother of Jacob. Joshua is a 2003 graduate of St. George Catholic School and a 2007 graduate of Providence Catholic High School. Joshua resides in Tinley Park with his wife Kelly and their dog Lucy. Joshua was a communications manager at Trace Ambulance from 2009-2013. He then expanded his communications experience in business development of Elite Ambulance from 2013 -2017. There Josh was responsible for the daily operations, marketing and the telecommunications department. He believes in the importance of customer service and constant professionalism in all aspects of the funeral industry. Joshua is a member of the Tinley Park and Mokena Chamber of Commerce. He continues to become more involved in the communities of Tinley Park and Mokena.